Jerusalem Marathon 10km - I Did It! The day started out cold and wet. Looking out at the slick roads winding their way below my brother's Jerusalem apartment, I imagined that I'd be doing more sliding than running in that day's race. But, as the old Aussie song goes, "Will you tie it up with wire, just to keep the show on the road?" - yep, the show will go on, and I'll do whatever it takes to make sure I'm in it. The taxi had difficulty reaching Givat Ram. Thousands of people were converging on the stadium. Some jogged slowly, warming themselves up for the race, others arrived by car, bicycle, and groups in sporty uniforms disembarked from coaches near the entrance. When I arrived inside the grounds at about 8.00am, the festivities were in full swing. A band was playing Israeli tunes, with an unlikely bagpipe accompaniment. At the registration tent, I obtained my runner's pack, complete with a t-shirt, timing chip to strap to my shoe, and an energy bar. It was hot, and unexpectedly so. Setting out on a run at 10.15pm might not exactly be the easiest time of day to go for a 10km run, but it should have been cooler. It wasn't. And I was hot. Angry, actually. I shouldn't have been, but I got upset at little nothings all evening and then I let it out on myself. I dressed in a hurry, slammed on my Brooks Adrenaline GT9s and ran out of the house, nary a stretch, my body unprepared for the grueling hour ahead. But I didn't care. I just needed to let off steam. At first I wasn't certain I would go the whole 10km. I was still wary of damaging my knee. But it was self-destruction time. I was in one of those moods. So out I went, into the unnaturally sweltering night. Blogger will soon remove its FTP service. 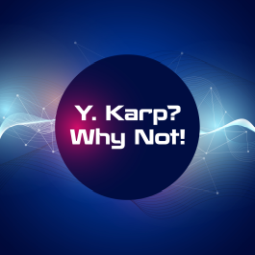 This means that I will not be able to publish directly to http://www.ykarp.com/. However, all traffic to that domain is now redirected automatically to http://www.ykarp.blogspot.com/. So you can retain your current bookmarks and keep coming back to http://www.ykarp.com/ for all the fun - and tell your friends! Since my injury on 23 December 2009, I have been training extremely lightly. 3km here, 5km there. Low-pressure jogging to keep the body going, but nothing strenuous. In fact, that was all I could manage for a while. I would run a few kilometers and then my knee would start hurting, so I'd stop. I saw an orthopedist who said my injury is a common one. Just a strain that will sort itself out in time. I don't have time! The marathon is on 18 March and I have to get into shape. But ill patience is what got me injured to begin with, so I forced myself to take it easy. Today I did my first 10km since 23 December. I ran strongly for the first 6km. Heading up the hill where I originally hurt my knee, I started to feel a twang. It got steadily worse. I decided to ride out the pain for just a little bit. Perhaps it will settle down. I'm from the future. The problem is, I can't prove it. That's the most frustrating part. If I was going to travel through time, it would be handy to have at my disposal a ready way to prove to you that I am from the future. But I don't. I'm only from two weeks in the future, so the technology is pretty much the same as today. There's no point in pulling out my new iPhone, e-book reader or some such other device because you could easily say that all I have is a prototype of a soon-to-be released version of the product. Besides, I didn't bring any of them back with me. I suppose I could give you tomorrow's winning lottery numbers if only I had taken note of them. Sorry.